BOULDER, CO, November 1, 2018 – Creative Alignments has been recognized as one of OUTSIDE’s Best Places to Work 2018. These companies provide great workplaces for employees and encourage a balance between work and enjoying life in the great outdoors, while also respecting the environment. Colorado companies represent a large portion of those honored with this distinction. Creative Alignments helps fast-growing companies hire talented employees using their disruptive Time-Based Recruiting model. They have turned traditional recruiting on its head by simply charging by the hour for the time it takes to fill a position for a company, rather than charging large commissions for each hire. By removing the motivation of a commission windfall, Creative Alignments is able to have a transparent and collaborative relationship with its clients and become a scalable extension of their client’s in-house team. “Companies from across the country entered a rigorous two-part survey process to make the winning list,” said Abigail Wise, online managing editor, OUTSIDE. “Employees took part in a survey to measure personal experience, while The Best Companies Group evaluated each company’s workplace policies, practices, philosophy, systems and demographics. 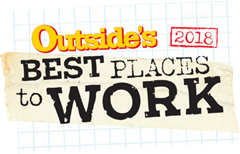 The complete list of OUTSIDE’s Best Places to Work 2018 is available at OutsideOnline.com. For more information on OUTSIDE’s Best Places to Work 2018 or to schedule an interview with an editor, please contact Kailey McGarvey at kailey@rosengrouppr.com or 646.695.7046. For more information on Creative Alignments, please contact Shenna Fitzgerald at shenna@creativealignments.com, 303-653-3235. Creative Alignments (CA) is a disruptor in the corporate recruiting space, using a Time-Based Recruiting® model that is more cost-effective than traditional commission-based recruiting. Whether a company is hiring one or 100 employees, CA establishes a flexible talent partnership that is focused on the company’s goals and aligned with its culture. While traditional percentage-of-salary recruiting firms are costly and candidate-focused, CA aligns with client companies to tap into great talent while saving them money with an innovative pay-by-the-hour process. Their experienced senior team recruits across all functions in the technology, food and consumer products, professional/general services and manufacturing industries. Learn more at www.creativealignments.com, 888-502-8944, Twitter: @CARecruiting, Facebook and Instagram: @creativealignments. OUTSIDE is America’s leading active lifestyle brand. Since 1977, OUTSIDE has covered travel, sports, adventure, health, and fitness, as well as the personalities, the environment, and the style and culture of the world outside. The OUTSIDE family includes OUTSIDE magazine, the only magazine to win three consecutive National Magazine Awards for General Excellence, The Outside Buyer’s Guides, Outside Online, the Outside Podcast, Outside Television, Outside Events, Outside+ App (also available on Google Play), Outside Books, and Outside GO, a revolutionary, 21st-century adventure-travel company. Connect with Outside Online and Facebook, Twitter, Instagram and Pinterest.